James Cohan Gallery Shanghai is pleased to present Alex: A Tribute to Alexander McQueen from November 17 through December 31, 2010. This inaugural exhibition series, The Passage Project, curated by the gallery’s Associate Director Leo Xu, is a tribute to the late British designer Alexander McQueen (1969 - 2010), whose tragic suicide shook the international world of fashion and design. 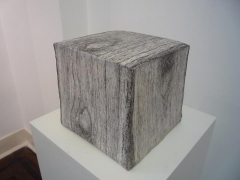 The exhibition features commissioned works by six young Chinese artists: Chen Wei, Cheng Ran, Guo Hongwei, Hu Xiaoyuan, Liang Yuanwei, and Qiu Xiaofei. In a widely noted essay by renowned Shanghai fashion critic Ian Lin, in memory to the designer, Lin’s elegiac message is clear, “When I feel desperate about the future, I would look out over the British Isles, calling McQueen from deep sleep: ‘Wake up, dead man!” The exhibition is a celebration of McQueen’s legacy, showcasing his talent and pervasive influence, and the empathy young artists feel towards the designer’s spirit and creativity. Alex starts with portraitures and reproductions of McQueen’s haunting signature skull motifs. Qiu Xiaofei’s Portrait # 2, following his Portrait #1, was made on the occasion of McQueen’s launch for the F/W collection in 2009. Tranquil and emotionally remote, Portrait # 2 portrays the designer in limbo, capturing a vague face and disconcerting look. While these portraits seemingly unveil the designer’s state of mind, addressing the tragedy of this young talent, Untitled is a simple yet surrealistic watercolor leading to a subconscious door, a reexhibitions theme in Qiu Xiaofei’s psychoanalytic explorations on canvas. Iconic imagery in McQueen’s designs epitomizes his dark aesthetics. 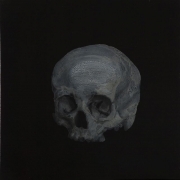 In Guo Hongwei’s works the skull—a classic symbol of mortality and change in vanitas paintings dating back to 17th century Dutch artists—is depicted with excessive oil and varnish, rendering a cold aura and sentimental link connecting death with beauty and belief. In Guo’s watercolor, Shade, composed of various black-and-white portraits overlapping one another, embraces other figures in modern China of young talents whose lives were cut short in their prime. Alexander McQueen was also a visual artist on the fashion catwalk in his own right and the exhibition may also be read as A Portrait of the Artist as a Young Man, referring to the semi-autobiographic classic by James Joyce. In exploring McQueen’s story, Chen Wei produced two staged photographs, intimating one’s struggle from within. 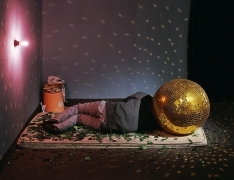 One photograph portrays a young man seated in a dilapidated stage set, whose unidentifiable face is hit by a single spotlight, while the other photograph depicts a figure lying on a mattress covered in broken glass, his head concealed by a mirrored ball in a room lit by glittering disco light. Similar tones of romanticism are also evident in Cheng Ran’s video. Through alternating music and the repetitive sound of gentle waves lapping the shore, the video begins with a long shot observing a scantily clad boy standing statue-like on a rock and winds up with a close-up of the boy’s face dotted with fake pearls reminiscent of the melancholy teardrops in Man Ray’s widely known photograph of 1930, Tears. 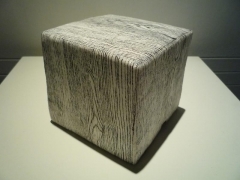 Hu Xiaoyuan’s meticulously painted object, Wood, narrows the focus as a meditative and methodical gesture by tracing repeatedly the textures and grain of wood panels as if the whole process provides a way of soul-searching through artifice. Liang Yuanwei’s abstract flora painting with their thickly imexhibitionso surfaces are mesmerizing and emotionally charged. These specific paintings are a tribute to McQueen’s 2010 S/S collection. The title of these works, taken from a quote by Oscar Wilde, “We are all in the gutter, but some of us are looking at the stars” shares Liang Yuanwei’s stance she finds in common with the uncompromising designer. For further information, please contact Leo Xu Lxu@jamescohan.comor +86-21-54660825 x 602.